A mobility Assistance Dog enables his recipient to be more mobile whether they are in a wheelchair, or use a walker, cane, or crutches. These dogs allow their handler to be more independent in day-to-day life. Little Angels will not only train mobility assistance dogs for adults, but also for children who demonstrate the ability to remain consistent with training exercises and are able to communicate clearly to the dog. Retrieving: Dogs are trained to retrieve hard to reach items on command, and can learn to retrieve specific items by name. Finding the Phone: Dogs are trained to locate the phone by scent and then bring it to their handler. Hold it: Dogs are trained to carry items in their mouths when told. Get Help: Dogs are trained to alert someone else in the home on command. Opening Doors: Trained to pull at a rope attached to doors and/or cabinets. Push Buttons: Trained to push elevator or door buttons on command. Lights: Can be trained to turn lights on or off. 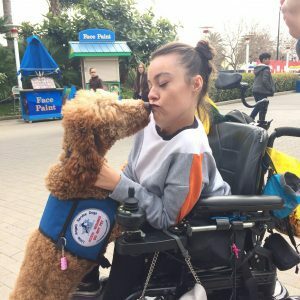 Is a Little Angels Mobility Assistance Dog Right for Me? Have a disability that hinders your mobility, but have adequate upper body st rength and muscle control in your arms. Submit a personal referral and medical documentation: If your initial application looks like a good fit we will reach out to ask for these additional documents. Handler Training: During handler training we work with you, one-on-one and show you how to reinforce the training your dog has already had. Once you and your dog graduate our program we stay in daily contact for the first month, followed by monthly, and bi-yearly consultations for reports on your dog’s ability to continuously provide assistance to you. Handler Training takes place in San Diego, California.